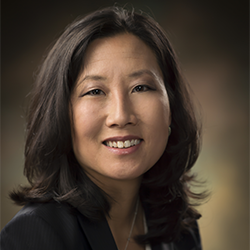 Tammy I. Kang, MD MSCE held academic, clinical and administrative appointments at Children’s Hospital of Philadelphia, Perelman School of Medicine at the University of Pennsylvania before joining Texas Children’s Hospital and Baylor College of Medicine as the inaugural Chief of Palliative Care and Associate Vice Chair for Clinical Affairs in 2016. Dr. Kang received her undergraduate degree from Stanford University and medical degree from the University of Colorado Health Sciences Center. She completed pediatric residency at the University of California San Francisco and a subspecialty fellowship in Pediatric Hematology/Oncology at the Children’s Hospital of Philadelphia. She is board certified in Pediatric Hematology/Oncology and Hospice and Palliative Medicine and is a national expert in Pediatric Palliative Care. While at The Children’s Hospital of Philadelphia, she co-founded and led the hospital’s first interdisciplinary palliative care program and served as the inaugural Fellowship Director. She was awarded numerous teaching and clinical awards including being selected as a Children’s Hospital of Philadelphia Master Clinician and elected to the prestigious academy of Master Clinicians for Penn Medicine. Currently, she is Chair of the National Pediatric Hospice and Palliative Care Collaboration, is involved in the American Academy of Hospice and Palliative Medicine and is on the Advisory Panel for Advanced Certification in Palliative Care by the Joint Commission. She serves as a reviewer for all major pediatric and palliative medicine journals and has published numerous peer reviewed articles, chapters and clinical reviews dedicated to improving the care of children with serious illness.